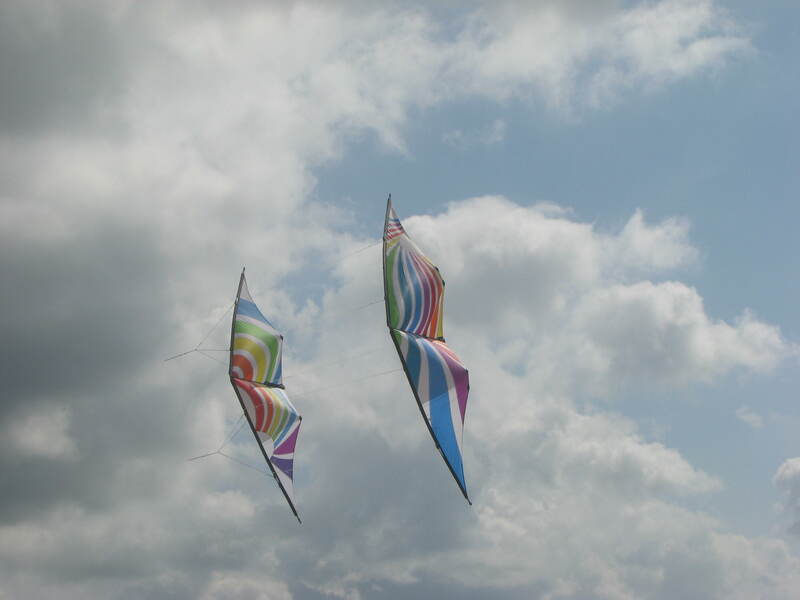 It’s been well over a year since I saw the Little Dreamer and the Dream On, dual line stunt kites by Skydog, flown as a stack. That stack was made up of the black versions of those kites. I knew that sometime in the future, I would have a stack like that, only with the white versions. Well, the future is here. Two weeks ago I purchased the Little Dreamer at our local kite store and obtained the proper train lines and pigtails. 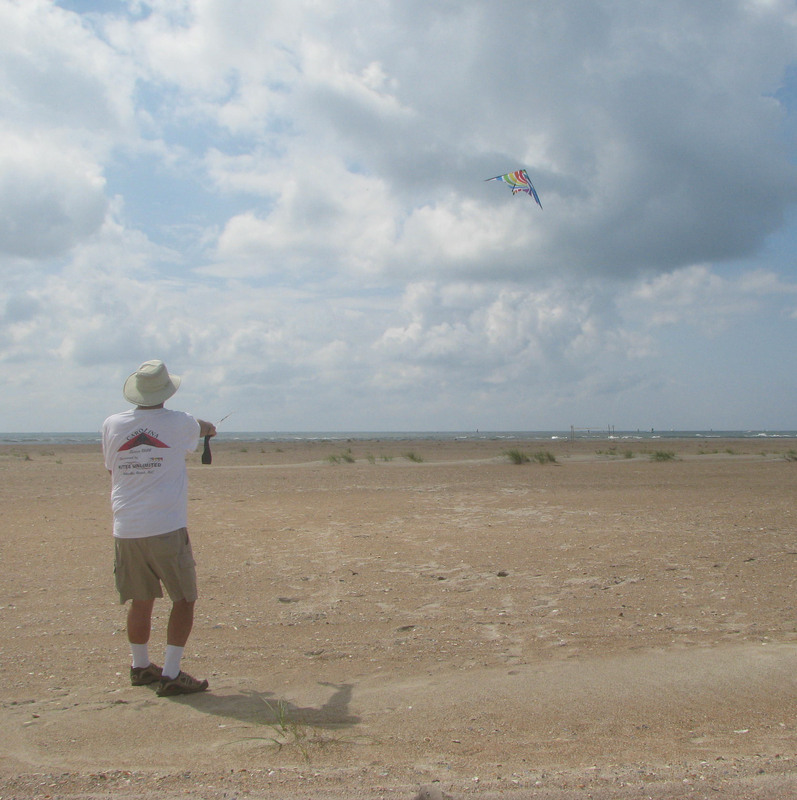 This past Sunday at the weekly Carolina Kite Club fly, I put the white stack in the air. The wind was around 10-12 mph and the temperatures had decreased to a tolerable level. The sun peeked out from behind the clouds at random intervals. In other words, a perfect day to fly. The best word I can think of to describe the flight of my little stack is “SWEET”. The two kites flew as one with hardly any pull to speak of. Loops, dives, figure eights, low-level flight and high; it was almost euphoric. And the rainbow colors stood out against the light gray clouds and the patches of blue sky. I may never fly those kites singly again. I was lucky in that there were friends of mine there that were more experienced flyers and could handle my stack while I took the images seen here. The one problem with flying a stack is that the flyer doesn’t get to really see what the stack looks like. He only sees the kite closest to him, not the ones behind. Only by having someone available to fly your stack for you can you really appreciate the spectacle it provides. So I was doubly lucky. I not only got to fly the stack, I got to see the entire stack in flight. 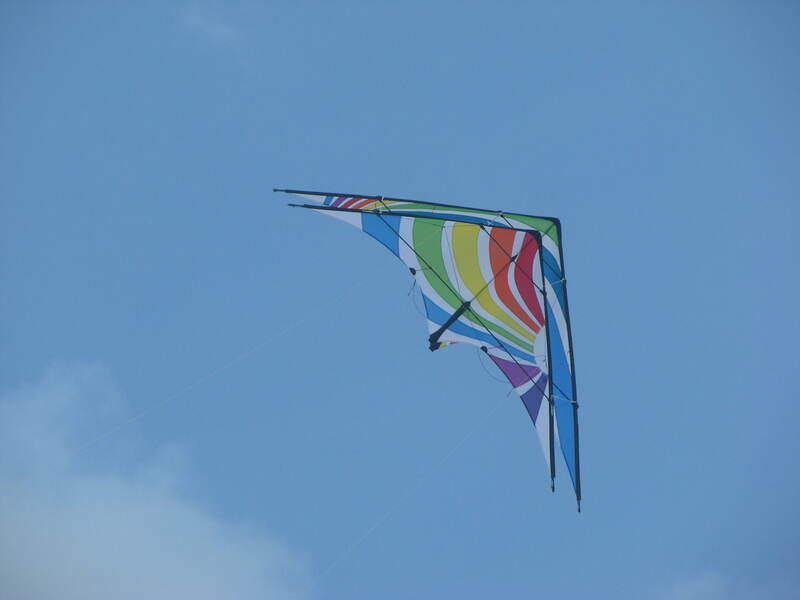 The morning was even better in that there were quite a few kite flyers on the field with me. The weekly fly brought out people of all ages and experience. Early on it was mostly dual line stunt kites but later arrivals brought more single line kites to put in the air. There was quite a show on the beach this day.